OK, here's a final excerpt from my paper on the Uniting Church's proposed preamble. This is from the paper's conclusion, where I try to illustrate what it might look like to make a confession about what it means to be the church in Australia. 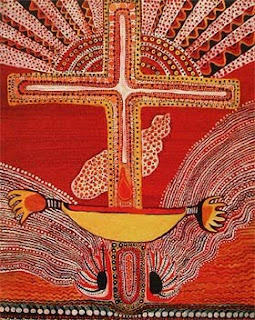 I am deeply sympathetic with the theological intentions of the new preamble to the Constitution, and I am convinced that the church in Australia needs to find creative ways to rethink and redefine its own identity in relation to the country’s indigenous peoples, those traditional custodians of the very land on which the church gathers. Chris Budden's question is in my view fundamental for the Australian church: ‘Can the church be the church in Australia if it does not properly honour the place of the Indigenous people in its life?’ And more than that, are we not denying the gospel itself—the message of Christ’s universal lordship—if we give the impression ‘that God was brought to Australia by the churches’? [...] Nevertheless, the whole voice of the document would need to be different, spoken from a different standpoint, if the preamble was to become an exercise of Christian confession and Christian discernment. together with the First Peoples of this land, our brothers and sisters in Christ, we confess that there is one body, one Spirit, one Lord, one faith, one baptism, one God and Father of all. Together we entrust ourselves to this God, pledging to journey together as Christ’s disciples: to speak the truth in love, to bear one another’s burdens, and to seek and find Christ in one another along the way.